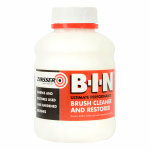 Quick drying, permanently blocks stains and odours, good adhesion for interior and spot exterior use. 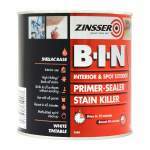 Zinsser BIN Primer Sealer is a shellac-based primer for interior and spot exterior use on a variety of surfaces. 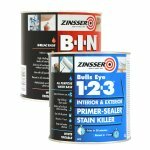 Suitable for use on ceilings, walls, doors and trim and exterior spot priming of metal, trims, PVC and wood. It also provides excellent adhesion for hard to paint surfaces, along with superior stain and odour blocking properties, making it ideal for water and nicotine staining. 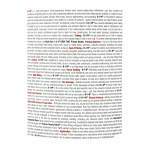 The shellac-based formula helps to seal porous surfaces and holds back bleeding knots and sap streaks. Application is by brush, roller or spray with coverage up to 12.5sq/m per litre. Touch dry in 15 minutes and recoatable in 45 minutes. 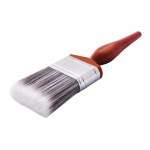 Perfection Pure Synthetic Brush 2.5"